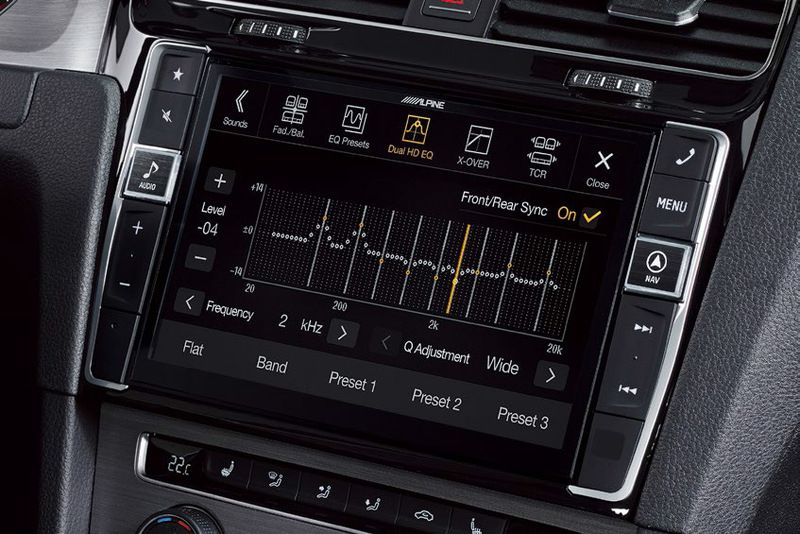 When we at Alpine decided to develop a high-end infotainment system for Golf 7 drivers, we had only one goal in mind: to create a high-end system that exceeds all available media products for the Golf 7 available to date. 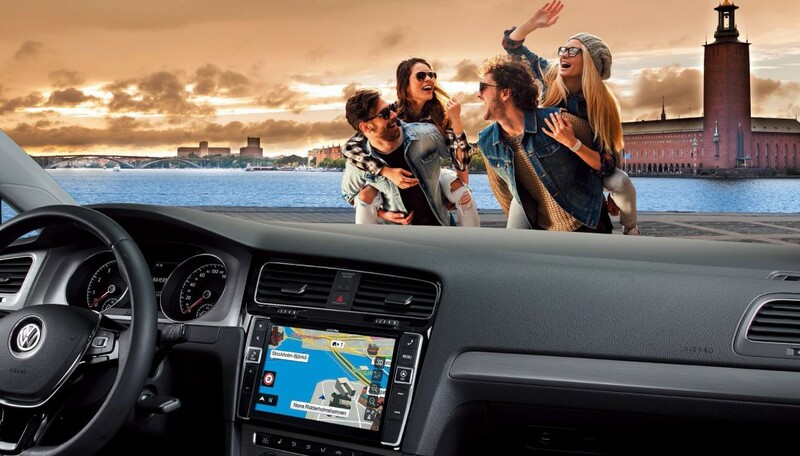 The result is a premium infotainment system with a brilliant 9-inch touch screen that perfectly integrates into the Golf 7 to bring the latest media compatibility, cutting-edge navigation technology and audiophile sound quality to your vehicle. All components are designed to fit perfectly in existing installation locations and integrate fully with the vehicle’s electronic systems. Turn your dashboard into a high-end cinematic experience: the highlight of the Alpine system is the high-resolution 9-inch touch screen – the largest screen for a Volkswagen dashboard to date. In fact, it is more than twice as large than the standard 6.5-inch VW screen. This extra-large size display will amaze you by its brilliant, high-resolution image quality – you must see it to believe it. The X901D-G7 Alpine Style system is surely one of the coolest upgrades you can buy for your Golf. It will guide you to your desired destination, keep you entertained with the latest media in perfect sound quality and assist you with narrow parking spots. Made for your Golf 7. 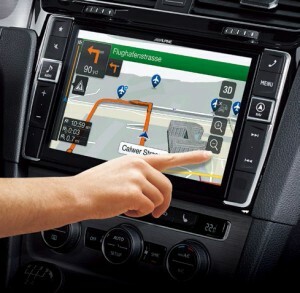 If your Golf has the original VW reversing camera installed it can be simply connected to the Alpine system as well. The camera activates automatically when reversing. If your car is not equipped with the original reversing camera we recommend upgrading with this useful feature. 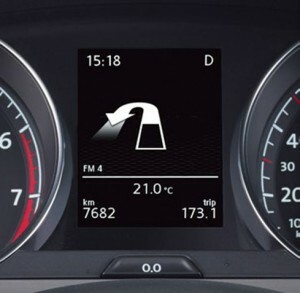 The VW radio display is used to show and set up vehicle settings and display warning messages such as low engine oil level. 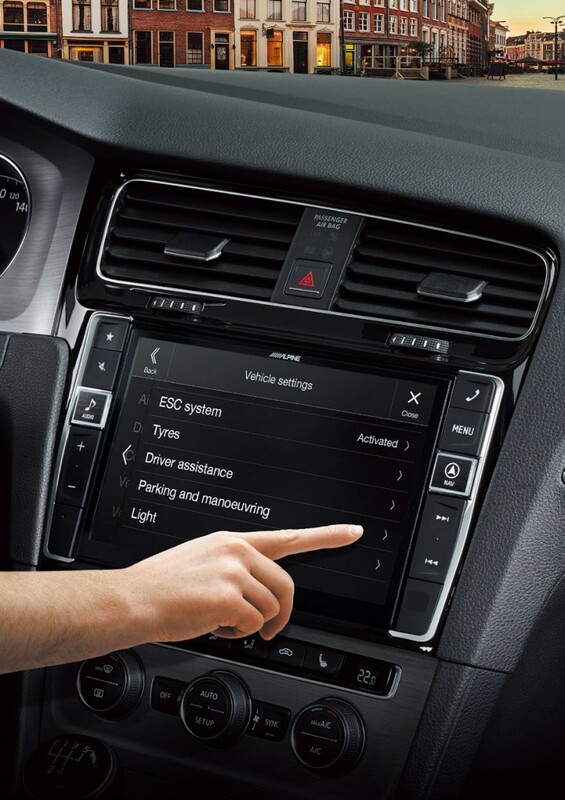 The Alpine system is fully compatible with the Golf 7’s electronic systems and can therefore display all menus and warnings (except original traffic sign recognition system). The built-in Bluetooth® module allows wireless connection of a mobile phone for handsfree communication, while frequent software updates ensure full compatibility with the latest phones. A very intuitive user interface makes operation extremely easy. Bluetooth® also enables audio streaming from the phone: audio content or even internet radio can be wirelessly enjoyed on the Alpine system. The Alpine system is fully compatible with the latest smartphones such as the iPhone 6S and the Samsung Galaxy S6 Edge. This offers many advantages: you can enjoy digital content stored on your phone such as music or video files, access your phonebook or simply charge your phone. 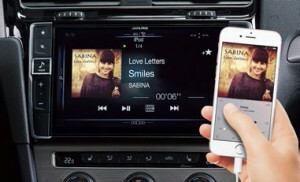 You can even activate Siri and voice-control your iPhone for maximum comfort and driving safety. Upgrade your Alpine Infotainment system with DVD and CD playback capability. The DVE-5300G fits per fectly in the Golf 7’s original VW CD drive compartment in the glove box. It uses HDMI technology for stunning image quality and can be fully controlled from the touch screen. An additional installation kit is required. All installation parts are included. 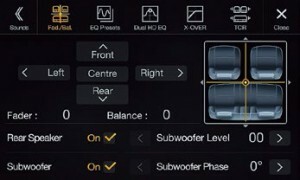 The X901D-G7 offers extensive sound adjustment options to get the best out of your Golf sound system and to adjust the sound to your taste and preferences. 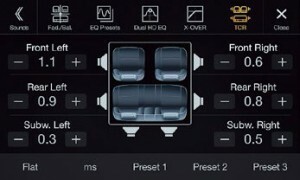 The built-in Dual 9-band Parametric EQ allows separate adjustment for the front and rear channels with professional detail. 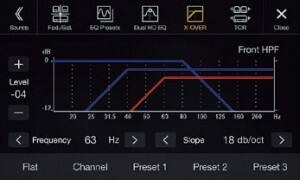 The digital crossover allows you to adjust cutoff frequencies for your speakers. This ensures a matching sound signal that can be accepted by your speakers without distortion. Updates can be purchased by country and by region. This saves cost by updating only what is necessary. 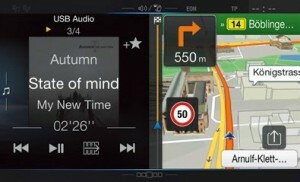 Within 30 days after the navigation system’s first GPS fix, you can go to www.alpine.naviextras.com to check if there is a map update available and download it free of charge. 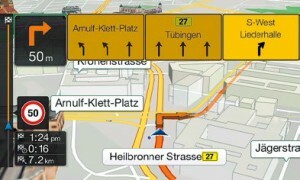 This ensures that you have the latest map data after purchase. 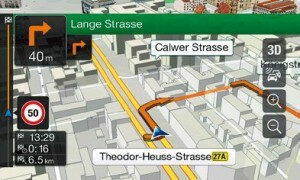 Use the virtual keyboard to input destination addresses and operate all navigation settings. You can input postal codes for all European countries, which makes searching for addresses quicker. The system even reads partial addresses and you can select your own language from 33 different keyboards. Alpine’s innovative “One Look” split-screen technology allows you to view the navigation map and audio playback information at one glance. This eliminates the need to switch between different applications. You can switch from full screen to One Look view with just a swipe on the display. Premium Infotainment System with 9-inch high-resolution touch screen and latest iGo Primo navigation software. Includes all installation parts and high-quality trim panel in piano black. 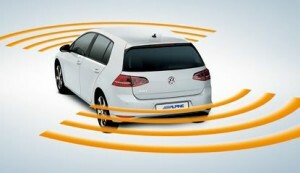 Compatible with all Golf 7 models (excluding Golf Sportsvan and GTE). 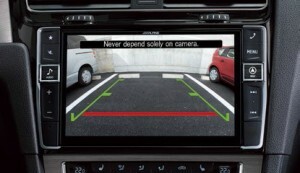 If your Golf is not equipped with a reversing camera, we recommend the original, stealth-design VW camera for Golf 7. It is fully compatible with the X901D-G7. To upgrade the X901D-G7 with an optical drive to playback DVD, DVD-R, DVD-RW, CD, CD-R, CD-RW discs using HDMI technology for best picture quality. Includes Golf 7 installation kit. 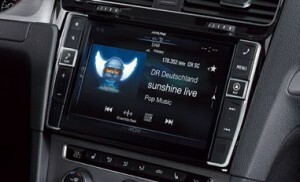 Upgrade your VW with this premium infotainment system for the ultimate in navigation, entertainment and sound quality. 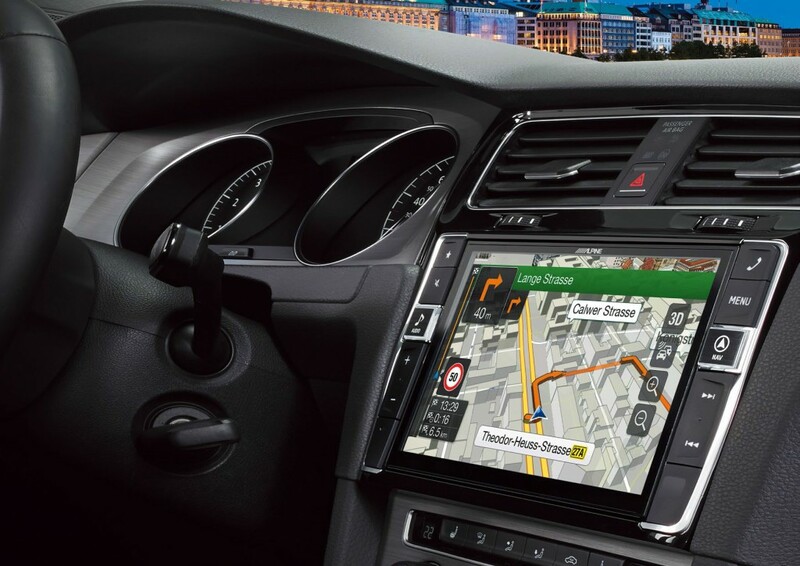 The XL 8-inch high-resolution touch screen brings a real cinematic experience to your dashboard – amazing for viewing navigation maps, inputting destinations with the virtual keyboard or simply enjoying a movie from your iPod, USB stick or DVD. The built-in iGo Primo navigation system keeps you on track in 48 European countries and features the latest navigation technologies and services. 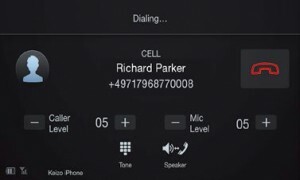 Connect your Bluetooth® enabled mobile phone for hands-free operation and audio streaming. 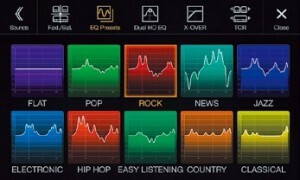 It even features a built-in DAB tuner for digital, noisefree radio reception and is ready to connect your iPhone or iPod to enjoy audio content stored on your Apple device. Note: Additional installation parts or restrictions may apply. Check your local Alpine website or ask your local Alpine dealer for more information on specific vehicle installations. KIT-8VWX and KIT-8VWTX support sub-display and HVAC/OPS *3 Visualisation on the Alpine screen*1 *2, includes DAB Antenna (Available for use with X800D-U / X801D-U). 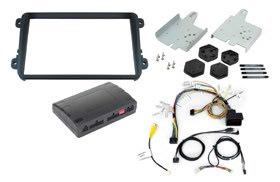 KIT-7VWX supports sub-display and HVAC/OPS (Heating, Ventilation, Air Condition/ Optical Parking Sensor) Visualisation on the Alpine screen, includes DAB Antenna (Available for use with INE-W997D, INE-W987D, iLX-700). In some vehicles, removing the factory head unit causes the parking sensor and climate control displays to disappear. By using the APF-D200VW, they both appear in the multi-function display in the instrument cluster. 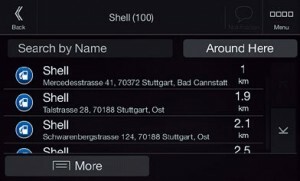 It works with all VWs that have white colour displays. On some models, when the factory head unit is removed and replaced with the Alpine monitor, you lose the parking sensor and climate control displays on the screen. With this interface, you retain this visual information. It also includes a steering wheel remote control and vehicle display interface.